I would 100% recommend the Caster Eye Center to everyone. 1. Lasik. The most common version of laser vision correction is Lasik, which has been performed in the United States since 1996. 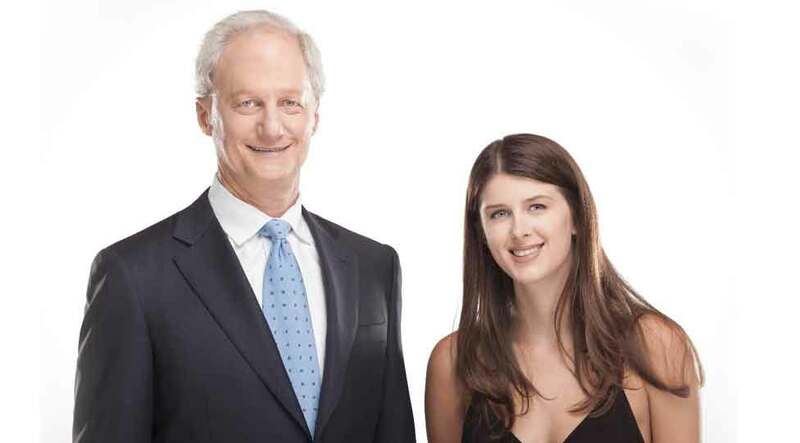 Dr. Caster was one of the twenty doctors in the United States who performed Lasik treatments as part of the original FDA approval process of Lasik. Lasik is a two-step process. The first step is the creation of a flap, which enables us to apply the second step, the laser reshaping of the eye, below the outer surface. By applying the treatment below the surface, we allow the eye to heal very quickly without any significant discomfort. We perform the Lasik version in the majority of our patients. 2. PRK, also known as Lasek or Advanced Surface Treatment. PRK is preferable for some of our patients, especially those with moderate dry eyes, thin corneas, irregularly shaped corneas, or certain hobbies such as boxing. PRK has also been performed by Dr. Caster since 1996. In PRK, the laser reshaping of the vision is performed near the surface of the eye, rather than deeper within the eye as in Lasik or Smile Lasik. 3. Smile (Small Incision Lenticule Extraction). Smile Lasik is the latest version of laser vision correction. Smile uses a cold laser to separate a thin lens-like layer from within the cornea, which is then separated and removed by the doctor through a tiny channel. Smile creates an opening that is only a fraction of the size of a Lasik flap, so Smile may be thought of as “small-incision Lasik”. Lasik, PRK, and Smile all produce the exact same improvement in vision. Each procedure offers advantages and disadvantages, so the best technique for you is based upon your individual eye measurements, visual needs, and lifestyle situation. You will discuss this thoroughly with Dr. Caster when you meet with him during your initial consultation. Laser vision correction has undergone tremendous improvements since first introduced in 1996. So what you read or hear from people who had the procedure many years ago may not be accurate for today’s laser vision correction technology. Of course, the vast majority of people who had the procedure in 1996 up until today are very, very happy, but we have figured out how to prevent most of the problems that some patients experienced with the earliest technology of Lasik. The treatments are very fast now, taking usually less than five minutes. PRK (but not Lasik) used to be associated with pain, but that has largely been resolved. Dryness, if it occurs, is now typically only temporary and largely diminished by taking Omega-3 pills. And with the newer Allegretto technology, the degree of night halos and glare after treatment is actually on average less than the pre-treatment amount of halos and glare that the patient had with contact lenses and glasses. Less halos and glare on average than contacts or glasses! The vast majority of patients no longer need glasses or contact lenses for distance vision after laser vision correction treatment. Almost all patients who have laser vision correction surgery see better without glasses after the procedure. After the initial treatment, 90% of patients will have 20/25 or better vision without glasses, and 99% will have 20/40 or better vision without glasses. 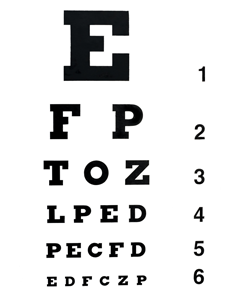 20/40 vision is good enough to pass the driver’s vision test without glasses. With the custom treatment, the results are even better: 96% of the patients achieve 20/20 or better vision without glasses, with 99% of the patients achieving 20/25 or better vision. For patients with mild nearsightedness, farsightedness, or astigmatism, the results are better. Patients requiring higher amounts of correction will have less accurate results. The general rule is: more accurate results will be obtained in people who require less treatment. If needed, the results can be further improved through a repeat laser treatment. There is no additional fee to have a “touch-up” procedure within the intial 18 months. We perform enhancement treatments in 4% of our patients. These results are very impressive, but it is impossible to tell you exactly what your results will be as every individuals’ case differs. No guarantees can be made about the outcome of laser vision correction surgery in any individual case, because each person responds in a slightly different way. If you will only be satisfied with “perfect” 20/20 vision without glasses after laser treatment, then please do not have the surgery. Avoid any doctor or clinic that promises you a specific result, because that simply is not possible. At Caster Eye Center, we have a dedicated and knowledgeable staff that can provide you all the information you need before your vision correction procedure. The quality of your vision after laser vision treatment at our Beverly Hills office is usually superior to vision with contact lenses or glasses. Patients generally have less glare than they had with contact lenses, and of course the inconvenience and discomfort of contact lenses is eliminated. Side vision isn’t blocked, as it is with glasses, and there is no longer the problem of dirty, wet or scratched glasses. Laser vision correction is subject to complications just like other types of surgeries. The complication rate is very low and problems can usually be readily treated. Complications will be more common in patients with high amounts of nearsightedness, farsightedness, or astigmatism, because these patients require larger amounts of treatment. Which is why we provide you all the information right in our Beverly Hills office, so you are aware of the needed treatments and the extra precaution you must take before considering Lasik for your vision correction procedure. By far the most common complication of laser vision correction is under-correction or over-correction. This occurs because the patient absorbs slightly less or more of the laser energy than anticipated, or because the patient experiences an abnormal healing response. Further laser treatment, known as an “enhancement” or a “touch-up”, can then be used, usually resulting in excellent vision without glasses or contact lenses. Under-corrections and over-corrections are the main reason that all patients do not have perfect uncorrected vision after the initial laser treatment. About 2% of laser vision correction patients will experience increased optical aberrations, including glare or halos at night. Every person, even if you have never had laser vision correction, to some degree has glare or halos when viewing a bright object against a dark background. Most people are not aware that they have glare or halos. You can demonstrate this to yourself by going outside, away from other lights, and viewing the moon; every person will notice a small glow or unevenness around the edge of this bright object. After laser vision correction, increased glare or halos is common during the first three months of healing. After the initial healing period, only a very small percentage of people will have more glare or halos than prior to the treatment, and a greater number of people will experience a decrease in the glare or halos. Large pupil size in low light in combination with a high amount of correction is more likely to result in increased glare or halos. Use of the newer lasers, with eye trackers and substantially larger treatment areas, has dramatically improved this problem. Many patients will experience dryness during the first weeks or months following treatment. Dryness is most common in people who have a lot of dryness prior to laser vision correction. Eyedrops or pills are used to control the dryness, which usually resolves by three months after treatment. Complications affecting the health of the eye are extremely rare, but are possible. During the early healing phase, the eye is susceptible to infection. You will be asked to follow certain instructions, including using antibiotic eye drops. Carefully following these instructions will decrease the infection rate to far below 1%. Even if an infection does occur, use of antibiotic eye drops will almost always control the infection. Steroid eye drops are very important after laser vision treatment, because they are used to control the healing response. However, if used improperly for too long, these drops can damage the eye by causing cataracts or glaucoma. It is very important to go to all scheduled follow-up appointments, especially if you are still taking steroid eye drops. About 1% of laser vision correction patients experience some loss of best-corrected vision, which is the best vision possible when using glasses or contact lenses. About 2% of patients will experience an improvement in the best corrected vision. Of course, you probably will no longer use glasses or contact lenses for distance vision after the surgery, so you may not even be aware that your best possible vision is different. Some professionals, such as commercial and military airplane pilots, care very much about their best-corrected vision. These pilots must have best-corrected vision of 20/20 in both eyes. If the best-corrected vision is anything but a perfect 20/20, the pilot’s license will be lost. A mild loss of best-corrected visual acuity might not even be noticed or might be just a minor annoyance. A severe loss of best-corrected visual acuity would be noticed by almost every patient and might make it hard to work in occupations that require fine vision. Severe losses of best-corrected visual acuity are exceedingly rare. Either an irregularity or a haziness in the corneal surface could cause a decrease in best-corrected vision. Short-term irregularities during the initial months of healing may occur in up to 5% of cases and almost always resolve as the healing progresses. Not all patients get a perfect result from laser vision correction. This may be due to under-correction, over-correction, or one of the complications described above. The most common problem is an abnormal healing response, resulting in under-correction or over-correction. Patients who experience under-correction or over-correction can usually undergo a second procedure to obtain a better correction. In most cases, a significant improvement in the vision will occur, but it is important to realize that this, too, is a laser procedure, and therefore has the same risks that the first laser procedure had. It is possible but extremely rare that your vision can be worse after a “touch-up” procedure. Complications can occur, even if no complications occurred during your first procedure. If your vision is quite good after your laser treatment, but not perfect, you should consider carefully whether you want to have a “touch-up” procedure. If your vision is really not satisfactory, then a “touch-up” procedure is a good idea. The enhancement procedures are quicker and easier to perform than the initial treatment. Nationally, 10-15% of patients undergo “touch-up” procedures. However, with the newer WaveLight Allegretto laser, the enhancement rate has been substantially decreased to 4%. Custom wavefront laser vision correction is an improved way of performing laser treatment that produces, on average, sharper and crisper vision, particularly better night vision. How does Custom laser vision correction do this? The eye has many minor imperfections that are not corrected by glasses or contact lenses. These are known as higher-order aberrations. Custom technology allows us to correct for some of these imperfections, an improvement in vision which cannot be achieved with glasses or contact lenses. Vision after Custom wavefront treatment is often better than it was with glasses or contact lenses. When performed with the Allegretto laser, Custom wavefront treatment has been proven to create better night vision on average than existed prior to treatment with glasses or contact lenses. The Allegretto laser is the only laser that the FDA states improves night vision on average to beyond the vision experienced with glasses or contact lenses. All treatments at the Caster Eye Center with the Allegretto laser are Custom Wavefront treatments. Which laser treatment is best for me? The most popular variation of laser treatment is called Lasik. Other names include IntraLasik, Femto-Lasik, and all-laser Lasik. In this technique, the laser treatment is made within the cornea, rather than near the corneal surface. This is accomplished by using a laser to create a protective flap in the front 20% of the cornea and then applying laser treatment to the tissue beneath the flap. The vision correction treatment can also be applied near the surface of the cornea (instead of under a protective flap), in which case the technique is referred to as Advanced Surface Treatment. This technique has several minor variations, which include PRK (for “photo-refractive keratectomy”), Lasek, and Epi-Lasik. In PRK, the thin layer of soft tissue coating the outside of the eye (the epithelium) is removed and the laser energy is applied to the firm tissue underneath. In Lasek–with an “e”–the soft tissue on the surface is replaced after the laser treatment. In Epi-Lasik, this thin layer of soft material is folded back using a machine. PRK, Lasek, and Epi-Lasik are very similar to each other. When the laser treatment is applied to the tissue deep within the cornea (as in Lasik) instead of near the surface (as in Advanced Surface Treatment), the healing is quicker with more rapid vision recovery. Smile Lasik is “small incision” laser correction. A laser is used to create a thin, lens-like layer within the cornea, as well as a narrow tunnel to the surface. The doctor reaches in to separate and remove the lens through the tiny tunnel. Patients usually see very well the next day after Lasik. In Smile, the intial healing takes a few days, and in PRK the intial healing takes about a week. Complete healing takes about three months with all three techniques. The visual results are the same with each of the versions of laser vision correction. The technique that is best for you depends on your very particular eye measurements, lifestyle, and visual needs. You will be able to discuss this and any other questions that you have when you meet with Dr. Caster during your personal consultation. Laser vision correction does not stop the eyes from the natural changes that can occur over time. For most people, the results of laser vision correction will last for their entire lives. But a small number of people, estimated at around 5%, will undergo a small lessening in distance vision over time. For these people, laser vision correction can be performed again to further improve the distance vision. Also, as people age past the age of 45-50, the near vision continues to worsen (“middle age eyes,” or presbyopia). We do not have a cure for presbyopia. Some people choose to deal with presbyopia by wearing reading glasses or progressive glasses. Others choose blended vision, in which one eye is adjusted for near vision or mid-range vision using contact lenses or with laser vision correction. Even if you had laser vision correction at a younger age, you can typically in the future have a repeat laser vision correction to adjust one eye for close-up or mid-range vision if you so desire. If you have blended vision with contact lenses, then we can create blended vision with laser vision correction. If you already have blended vision with laser vision correction, and the near vision has gotten worse, a repeat “tune-up” laser vision correction can typically be performed to further improve the near vision. Some people obtain very good vision after their first laser vision treatment, and are typically not wearing glasses or contact lenses for distance vision anymore, but the vision is not as good as possible. This group is around 10-15% nationally, but at the Caster Eye Center is only 4% (one in 25 patients). These people are suggested to have a tune-up procedure after full healing is complete, which is typically three months after the original treatment. At the Caster Eye Center, there is no additional charge for this type of enhancement treatment, as long as it is performed within 18 months of your original treatment. Most of the people who are waiting to have this type of enhancement treatment are not wearing any glasses or contact lenses for distance — the vision is quite good, but not as good as we can make it. RK (radial keratotomy) was a popular form of vision correction before 1995. With radial keratotomy, multiple incisions were made in the cornea to correct nearsightedness with or without astigmatism. No laser was used in RK treatment. Although the RK treatment eliminated the need for glasses or contacts, it was not as accurate nor as easy as our current laser treatments. People with previous RK will sometimes experience a change in their vision as they age, with the new development of farsightedness, nearsightedness, or astigmatism. This new vision problem can be corrected with laser vision correction, using either the Lasik or the PRK technique. Dr. Caster has corrected the vision of many hundreds of people with previous RK. The treatment laser must be programmed in a slightly different fashion to obtain the ideal correction, but with this modification, the results of laser vision correction in people with previous RK are very positive. 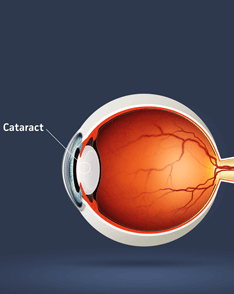 Cataracts are a clouding of the lens inside the eye, resulting in a clouding of the vision. Cataracts are not caused by laser vision correction, nor are they treated with laser vision correction. Cataracts also cannot be treated with glasses or contact lenses. If the cataracts are mild and are not affecting the vision to any significant degree, then no treatment is required. If the cataracts are significantly negatively impacting the vision, then the treatment is to remove the cloudy lens from within the eye (cataract extraction) and replace it with a new artificial lens (lens implant). Sometimes after cataract removal, glasses are still needed for ideal distance vision. In these situations, laser vision correction can be easily performed to improve the distance vision and eliminate the need for glasses for distance vision. Of course, if the vision is hampered by other problems, such as macular degeneration, then laser vision correction will not be helpful. In 2008, the FDA conducted a highly publicized review of quality of life following Lasik laser vision correction. The Caster Eye Center was proud to be selected by the non-profit Council for Refractive Surgery Quality Assurance, a patient advocacy group, to participate in a national survey for this important FDA meeting. Our office was one of six throughout the United States, each selected for its outstanding reputation, to participate in this confidential survey of 1,800 Lasik vision correction patients. The patients were selected at random and the results were confidentially obtained and tabulated by the Council for Refractive Surgery Quality Assurance. The study showed that more than 99% of patients reported their overall quality of life to be as expected or better than expected after laser vision correction. 96% wear corrective lenses as often as expected, less than expected, or much less than expected. 96% report post-treatment vision without lenses as expected, better than expected, or much better than expected when compared to pre-treatment vision with glasses or contact lenses. 7% report side effects, none of which were more than seldomly problematic; 91% of these patients who report side effects said they would have the treatment again. In the patients treated by this select group of doctors, 0.4% — only one in every 250 patients – would not recommend the LASIK treatment to a friend. Although we wish that we could make this number zero, and we are trying, I still think that this is an exceedingly small number of people who are not adequately satisfied. This is an extremely low dissatisfaction rate compared to other types of medical procedures, or other types of activities in general. The two main problems reported by these laser vision patients were feelings of dryness and night vision issues such as halos and glare. Of course, many people have difficulty with dryness and night vision problems prior to laser vision correction when using their glasses or contact lenses. Our goal is to not make the dryness and night vision problems worse, or even to improve pre-existing dryness and night vision issues compared to glasses and contact lenses. Both of these side effects, in our experience, are typically temporary and are largely preventable on an ongoing basis because of the latest advancements in the technology and by matching the right patient to the right procedure. Unfortunately for patients, the average laser center results are not nearly as good as our results. Patients need to spend more time selecting an excellent doctor and not be swayed by low prices. Low price equates to lower quality equipment and personnel, less intensive screening testing, and a less exacting attitude, with resulting lower quality visual results. The above survey shows the results that we at Caster Eye Center are able to provide for our patients who choose Lasik. Los Angeles patients are thrilled to experience the best treatment possible. We are proud that Caster Eye Center was chosen as one of the top sites in the nation to survey for this important FDA evaluation. We are proud of the work we do and of our results.